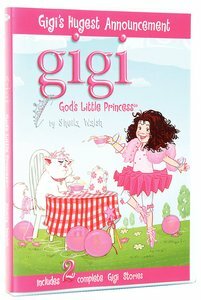 This DVD presents two fully animated Gigi stories based on the books The Royal Tea Party and The Pink Ballerina. Join Gigi and her best friend Frances as they learn all about how important they are to God. Ages 3-7. 60 minutes. About "Gigi's Hugest Announcement (#02 in Gigi, God's Little Princess Series)"
The Royal Tea Party finds Gigi with a dilemma. She has important news to share with her best friend, Frances, but how best to make such a grand announcement? This slice-of-life peek into the life of God's little princess reinforces the vital message that each child is royally important to God.